Ultrasound scanning, also called “ultrasound imaging” or “sonography,” uses high-frequency sound waves to produce images of the body. Ultrasound does not use ionizing radiation and does not involve x-ray exposure. Ultrasound images are captured in real time and show the structure and movement of the body’s internal organs, as well as blood flowing through arteries and veins. Ultrasound imaging helps physicians diagnose medical conditions such as those involving the liver, gallbladder, pancreas, spleen, kidneys, bladder, uterus, ovaries and testicles. • Abdominal pain or distention. • Stones in the gallbladder or kidney. • An aneurysm (balloon like bulging) of the aorta. • Narrowing or blockages to blood flow (such as blood clots). • Tumors and congenital vascular malformation. You should wear loose and comfortable clothing. You may be asked to wear a gown during the procedure. • Nothing to eat or drink 6 hours prior to the examination. • Nothing to eat at least 6 hours prior to the exam. • Drink 3 glasses of water 1 hour prior to your exam. Please do not empty your bladder. A full bladder is usually necessary for the exam. • Use a Fleet enema prior to the examination. Drink 3 glasses of water 1 hour prior to your exam. Please do not empty your bladder as a full bladder is usually necessary for the exam. • If you have had any prior mammograms, breast ultrasounds or breast MRIs at another facility, please bring them with you on the day of your appointment. You will be comfortably positioned on the examination table by a technologist. The ultrasound technologist will apply gel on your skin and firmly place a transducer against the part of your body to be examined. You may feel mild pressure from the back and forth motion of the transducer. After the necessary images are obtained, the examination is complete. Depending on the type of exam, the entire exam is typically completed in 20 to 45 minutes. A sonohysterogram is a specialized type of ultrasound examination primarily focused on a woman’s uterus and its lining. 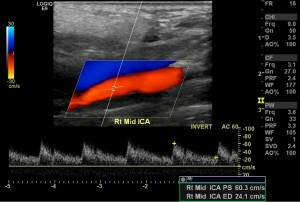 Ultrasound scanning uses high-frequency sound waves to produce images of the body. Ultrasound does not use ionizing radiation and does not involve x-ray exposure. 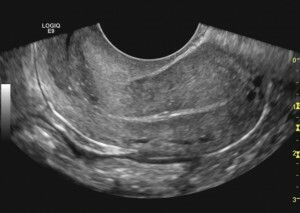 The sonohysterogram is best performed one week after menstruation but before ovulation. Our office can accommodate you to fit your scheduling requests. On the day of the exam, please wear loose and comfortable clothing. You will be asked to wear a gown during the procedure. Prior to the procedure, you may be given a mild over-the-counter medication to minimize any potential discomfort. Women should always inform their physicians and the technologist if there is any possibility of pregnancy. The procedure is like a gynecological exam with you positioned on your back on the exam table and feet in stirrups. After reviewing an initial ultrasound, a speculum is then inserted which allows for a catheter (thin tube) to be inserted into the cervix. The speculum is removed and ultrasound probe is reinserted. Sterile saline then fills the uterine cavity. After the necessary images are obtained by the radiologist, the examination is complete. The examination is typically completed in about 30 minutes.